With the combination of the wind through surrounding trees and the bright moonlight, I didn’t sleep well last night. I used my earplugs and that helped a bit. I decided to start hiking early knowing that the first half of the day had a lot of elevation change and that Bloodbath and Rampage hike a faster pace than me. I left at 6:15am knowing we’d see each other by lunch. We have entered the Scapegoat Wilderness. The wind had brought in a thick haze from a nearby fire and there was a slight campfire scent in the air. It’s been quite hot lately and it was surprisingly cooler this morning with strong winds and temps in the 50s. It was perfect for the strenuous hiking of the morning. I started the audiobook, Empire Falls by Richard Russo. I was looking forward to this book, but after a few hours of listening, I’ve yet to get into it much. The hiking ended up being much more enjoyable than we thought it would be this morning. It wasn’t as strenuous as we feared and the views were memorable views along the Divide. The haze affected the views, but thankfully it didn’t fully obstruct it. Again, I really enjoyed having the morning to myself and just hiking my own pace. Bloodbath and Rampage did catch up to me at lunch and we hiked together the rest of the day. 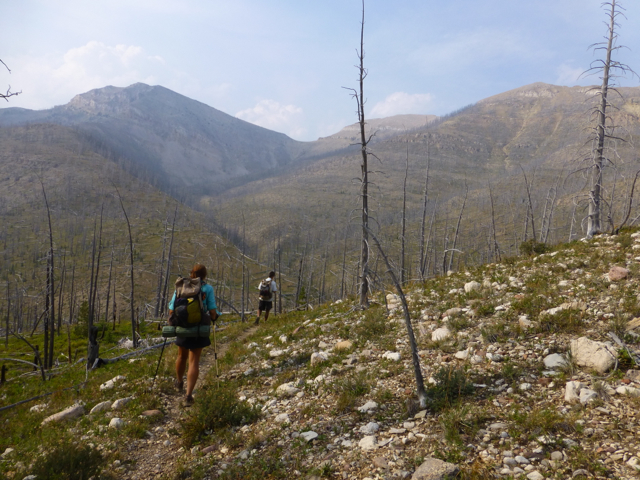 The second half of the day was at a low elevation in a river valley with much of it in burned areas. The second half of the day dragged through the burn areas. Rampage and I listened to a couple hours of another audiobook called, Flight Behavior by Barbara Kingsolver. Bloodbath and Rampage were still hiking a fast pace and I fell back a bit on and off depending on the terrain. We have decided to camp together the rest of the days and each want to enjoy these last few days at our own pace and routine, so we may not hike together much of the day. We are all really happy with this strategy as it’s the best way for us all to hike our own hike and still overlap and camp together. The great news is that today was our last really big mileage day. I think that everyday from now on will be less than 30mi days except for one day maybe in Glacier that is just a bit over 30mi because of where the campsites land. It will be great to sleep in and get done early the last two legs! 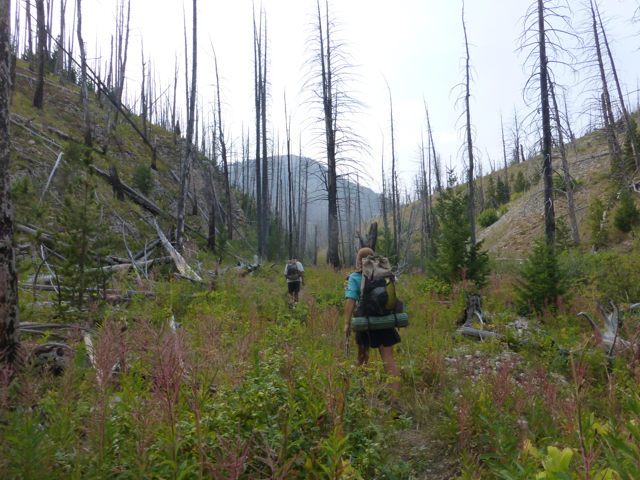 There is a reroute coming up for a day or so in the Bob Marshall Wilderness and we’ll probably stick together for that. We ended up eating dinner an hour before camp just as a precaution for bears since we are getting back into an area where grizzlies might be around. 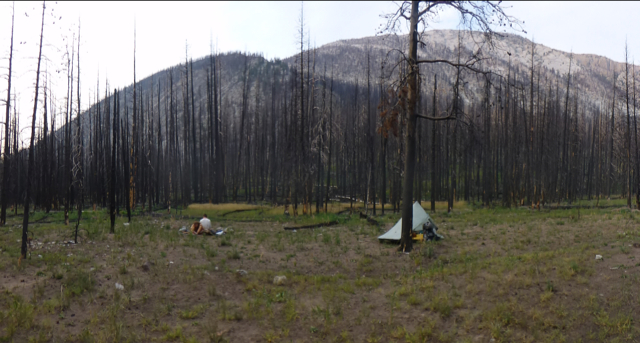 It was difficult to find camping among the burn where there weren’t a ton of dead trees ready to fall on us at any moment. We found a spot a bit off trail that had and good open space. It’s pretty warm and I’m sleeping in a t-shirt and shorts. 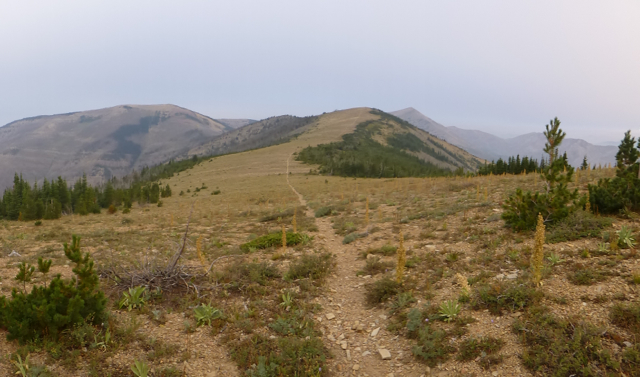 Tomorrow, we have a half day of hiking to Benchmark Ranch where we will pick up our resupply boxes and hike on a bit further to start our next to last leg, wahoo!